In need of Christmas presents? You don’t believe in gifting? Whatever is your life philosophy, our Bazaar is the place to be! 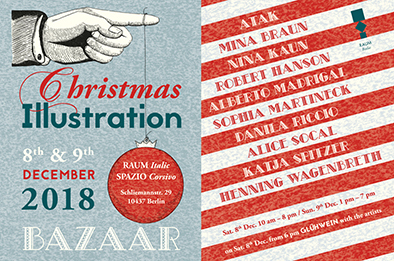 How can you resist art combined with free Glühwein? Come by to meet the artists, have a look at their creations, chat, toast and bring friends! A lot of friends! On the 9th, even without Glühwein, it is still worth it to join us! And again, bring friends, a lot of friends!